A detective tale with a jazzy soundtrack and… chickens. Simple animation but a fun romp. In true hard-boiled detective style, a rooster tries to find the thief of the egg that was stolen from his chicken. Soon all traces point towards the farmer. But before the egg can be saved from becoming hard-boiled itself, the rooster and his chicken have to fight the farmer’s cat for it. Spectacular action, including a fight, a chase, and the birth of a new chicken. Hard boiled detectives aren’t only found in the pulps and, by necessity or chance, can be found on many a planet in the science fiction galaxy or fantasy universe. 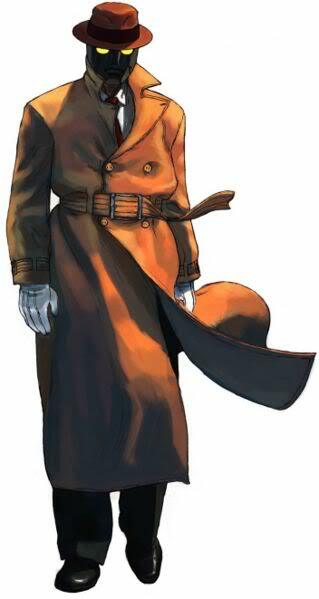 The uniform changes slightly from gumshoe to gumshoe, but the quick patter, ability to take a punch, and cynical streak of unbendable morality is consistent, even if it is hundreds of years in the future or hundreds of light-years into the beyond. The first detective I met in the pages of a science fiction book was probably R. Daneel Olivaw in The Caves of Steel. He isn’t quite cut from the shamus twill of the paperbacks – he’s just a self-aware robot trying to help solve a crime amidst and despite anti-robot sentiments – but he introduced me to the idea that a SF detective novel could be written.